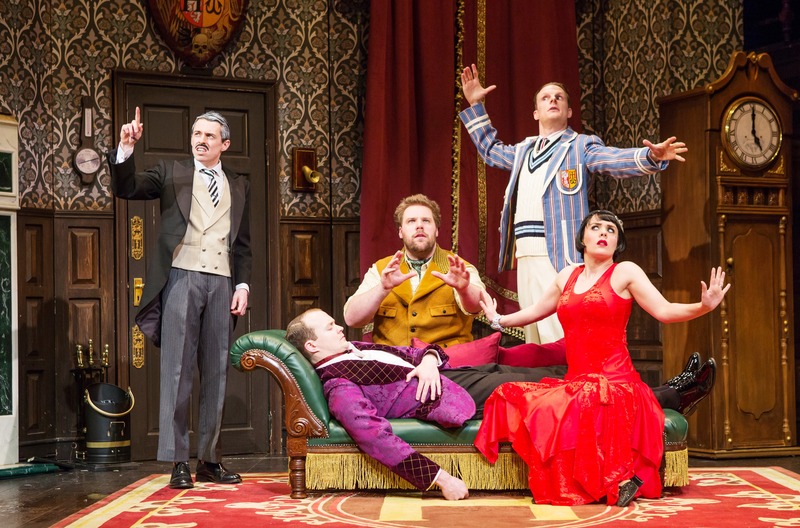 Two-thirds of “The Play That Goes Wrong” is hilarious. The other half (apologies to Yogi Berra) is just funny. If you’ve ever appeared in a play, or produced, directed or stage-managed one, something that goes wrong in “Goes Wrong” has gone wrong for you. Just not everything, at least not all in the course of one performance. The screw-ups during the (fictional) Cornley University Drama Society’s presentation of “The Murder at Haversham Manor” are relentless. There’s barely time to take a breath between them, which actually starts to dull one’s comic-appreciation-edge with 20 minutes or so still to come. 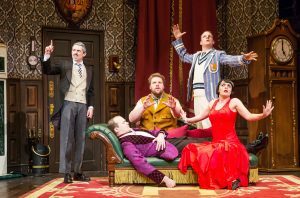 Having noted (and dismissed) that factor, the U.K.’s (actual) Mischief Theatre production of “The Play That Goes Wrong” is a treat. Co-written by Henry Lewis, Jonathan Sayer and Henry Shields, all whom appear in it, and directed by Mark Bell, who does not (someone had to engineer rehearsals), “Goes Wrong” is a master class in comic invention and execution. The cast’s split-second timing of the intricate repartee is astounding; that they all survive the physical aspects is miraculous. For verbal dexterity, there’s the scene where the rapid back-and-forth dialogue is inverted, with the answers coming before the questions, which is funny on its own. But the topic is framed such that the inversion becomes a risqué exchange. It has to be heard to be believed. 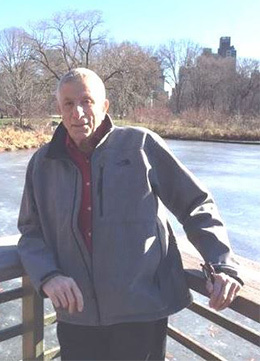 An ingenious bit of physical business has the recipient of a phone call unable to get to the phone (don’t even ask why), so the others form a hand-to-hand chain from the receiver, ending with the familiar mimed-phone fingers held to his ear. There’s even a brief interruption for a broken connection. You couldn’t make it up. But these folks did. The “Haversham Manor” title page notes that the production “was made possible by the British-American Cultural Exchange Program” (say what? ), while the “Goes Wrong” page informs that the actors “are appearing with the permission of Actors’ Equity Association.” Fictional, real or somewhere in between, they are more than welcome.